The No. 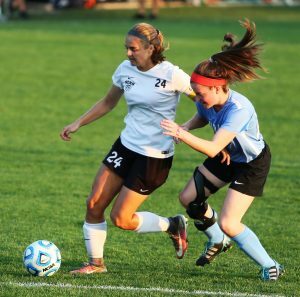 1-ranked Penn Girls Soccer Team was looking to finish off and incredible regular season for their seniors as they went up against the John Glenn Falcons on Thursday, Sept. 28. The Kingsmen finished up the regular-season unbeaten with a 5-0 victory against the Falcons. Kristina Lynch led the Kingsmen attack with two goals. Mary Kaczynski, Kelsi Carrico, and Brooke VanDyck scored one goal each. The Kingsmen finish the season off in brilliant fashion with a 16-0-1 record. The Senior Class has an amazing four-year record of 61-2-5. The journey continues for this talented Kingsmen team on Tuesday, Oct. 3, when Penn plays Riley in the opening round of the Penn Sectional.